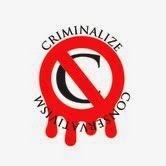 Criminalize Conservatism: Can We Separate Stupidity From Conservatism? Can We Separate Stupidity From Conservatism? The short answer is "No!" "EXCLUSIVE: John McCain Apologizes To Supporters For Sarah Palin, 'Inflicting Her On Our Proud Nation.'" "After news broke of Sarah Palin and her family getting into a drunken snowmobiling brawl, Sen. John McCain’s office reports they have been inundated with calls and emails from angry supporters who blame the Senator for introducing her to the nation. "'Thank you for your note. Yes, I too was horrified when I read about Sarah Palin and her family getting in a drunken snowmobiling brawl. Not a day goes by when I don’t regret selecting her as my running mate, and I apologize to you and your family for ever inflicting her on our proud nation. "'The office says that “Sen. McCain will sign and send a letter to any American who feels that his introduction of Gov. Palin angered them. If you want your own letter, just contact us through our official government website at www.mccain.senate.gov...'"
"Sarah Palin: 'Don’t Forget Your Umbrella' During Solar Storm." "Sarah Palin reminded a national television audience this morning to use their umbrellas during today's solar storm. "The former Alaskan governor appeared on Fox and Friends to promote her new children's book on how the liberal media is destroying America. Midway though the interview, anchor Brian Kilmeade took a minute to update the audience on a breaking news story. "'Solar storms can be very dangerous. In 1989 a powerful one took out the entire power grid in Quebec. This one is expected to be less severe, however...'"
"Sarah Palin reportedly asks dumb question during weekend brawl." "Amanda Coyne is the namesake of AmandaCoyne.com that has the tagline 'Inside Alaska politics……so you don’t have to be.' And thank goodness for her. Otherwise, we would not have learned every delicious detail of last weekend’s South Anchorage birthday party brawl that reportedly involved Sarah Palin’s family. "Palin is the former half-term governor of Alaska and losing 2008 Republican vice presidential nominee who is now a wealthy best-selling author and reality television star. We all know who she is. Certainly, Alaskans know who the Palins are. 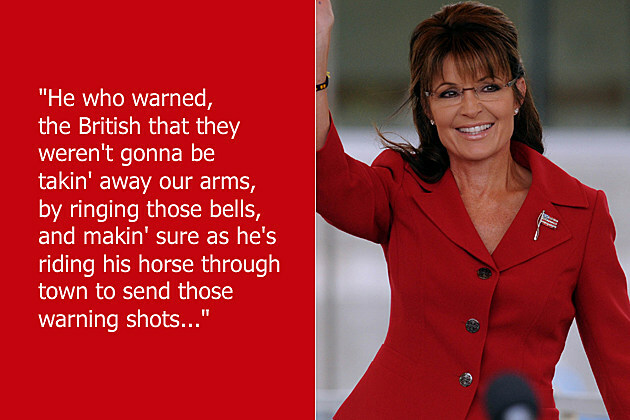 Yet, that didn’t stop Palin from reportedly yelling, 'Don’t you know who I am?' during the fight. That’s a major no-no of celebrity. You just don’t do that. And if you’re the Palins, you really shouldn’t have to do that in Alaska, of all places..."
"Brian Kilmeade Is a Pig." "It should come as no surprise to devoted hatewatchers of Fox & Friends cohost Brian Kilmeade is kind of a pig. But when several of his piggish comments are lined up one after another — hoo boy. It's pretty gross. "Kilmeade made headlines earlier this week by joking that the lesson of the Ray Rice elevator video (you know, the one that shows him punching his future wife in the face until she falls unconscious) is 'take the stairs.' Ho ho ho! What fun we're having with domestic violence! "That's far from the first time Kilmeade has succeeded in being the creepy uncle of Fox News; Media Matters has compiled a pretty great highlight reel of just a few of the things he's said to and about women over the years, along with the context in which he said those things (spoiler: the context kinda makes things worse). Not included: this segment about 'Daddy approved' prom dresses wherein Kilmeade creeps on a teenager..."
"Colbert Study: Conservatives Don't Know He's Joking." "Last week, Stephen Colbert revisited a segment he had done on Florida Representative Bill Posey, who sponsored a bill that 'would require future presidential candidates to provide a copy of their original birth certificate,' in order to put insane rumors of President Barack Obama's birthplace to bed. "This study investigated biased message processing of political satire in The Colbert Report and the influence of political ideology on perceptions of Stephen Colbert. Results indicate that political ideology influences biased processing of ambiguous political messages and source in late-night comedy. Using data from an experiment (N = 332), we found that individual-level political ideology significantly predicted perceptions of Colbert's political ideology. Additionally, there was no significant difference between the groups in thinking Colbert was funny, but conservatives were more likely to report that Colbert only pretends to be joking and genuinely meant what he said while liberals were more likely to report that Colbert used satire and was not serious when offering political statements. Conservatism also significantly predicted perceptions that Colbert disliked liberalism. Finally, a post hoc analysis revealed that perceptions of Colbert's political opinions fully mediated the relationship between political ideology and individual-level opinion." This post is the 169th entry labled "Conservatives Are Stupid," and we suspect there will be many, many more before the year is out. The old saw, "The Republican Party is made up of a few smart people and a whole lot of stupid ones," has never been more true than now since the inmates (Teabaggers) took over the asylum (GOP). Our title, "Can We Separate Stupidity From Conservatism?," was a sham...the neuroscientists tell us that there's no cure in sight, we still can't cure stupidity anymore than we can cure hate, but we can criminalize Conservatism! "Wouldst thou be nothing? Then, my son, be a Conservative!"